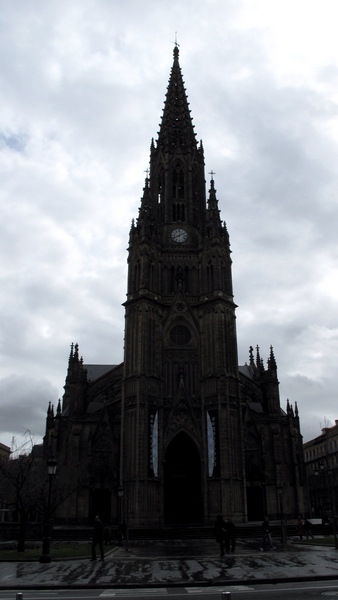 After I left Etxebarri, it takes just over an hour to get to Donostia/San Sebastian. After some freeway hijinks, I found the right neighborhood for my pension and settled in for the evening. The next day, on the way to return the rental car, picked up this ensaimada. Deeelicious. Not really native to this area, but this was a good one. Little bit of apple filling inside the rolled part. I admit, I'm obsessed with these things. Have I mentioned not to rent a car in Spain? Yeah, don't do it. I found the rental place okay, but then I realized that although I had filled the tank just outside of town, just some incidental driving and being lost and whatever, it was like 1/8th of a tank less than full. Were I to return it less than full, I would get charged 20 euro (about $23 bucks, plus like 3 euro per liter, even though it's only about 1,45 euro per liter. So it would have been about US$50 surcharge just because it was one tickmark less than full. So I set about finding a gas station, of which there aren't many in this resort town of Donostia/San Sebastian. So basically, a few miles over to the freeway onramp, then kinda get on the freeway, but they have a chicken out roundabout to head back in town. Then I missed a turn and had to go around the hill again. Good thing I topped off! By the way, gas stations don't have the little fume blocker accordion thing on their gas pumps, so the fumes are rushing out as the gas gets pumped in, and it seems like a static electricity spark or a cell phone call would light the car up in an instant. I'm not complaining - just saying, don't rent a car, don't smoke while pumping gas. This is the main cathedral close to the center of town. I should mention, the nomenclature around here is a little confusing. The Vieja, or Parte Vieja or Old Part of town, is along the northeast part of the Concha (circular beach) and goes on a bit toward the east. This is where most of the pintxo bars and the Bretxa market are. The center, where I stayed, is not too far, kind of the middle part of the Concha but stretches south, away from the water, but is more modern, and is the cool shopping area. Antiguo (sounds like it would be the old part, but it's own old/modern area), is furthest west, toward Ondaretta beach. 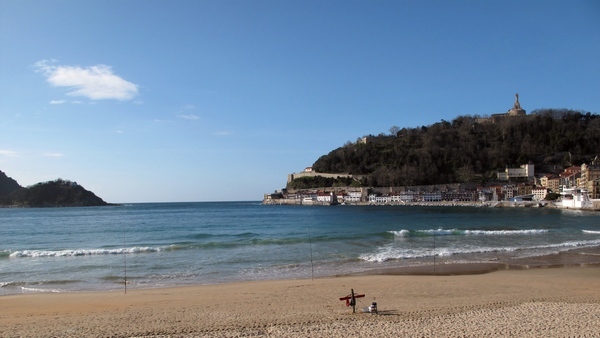 Donostia is the Euskera (eh-oos-keh-ra, the name of the Basque language) name for the town, San Sebastian is the Spanish name. Euskera and Euskadi culture were actively suppressed during the Franco era, so from being a dying language, it is now used openly and taught with regular Spanish to most children. Has some parallels to the Hawaiian language resurgence in Hawai`i. Noel is a college buddy of mine who I had lost contact with, but we recently reconnected on the facebook. He currently lives in Donostia/San Sebastian, and he graciously rearranged his schedule to show me around, do a bunch of research, introduce me to his friends, and gave me a look at real life here, which I never would have gotten. I'm so fortunate! I would have just eaten from one side of the city to the other without seeing a damn thing or meeting anybody. 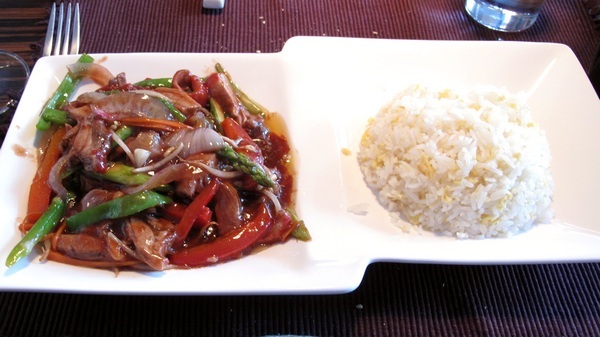 I was ready for a change of pace in terms of cuisine, so we went to a Chinese/Japanese place for their menu del dia. 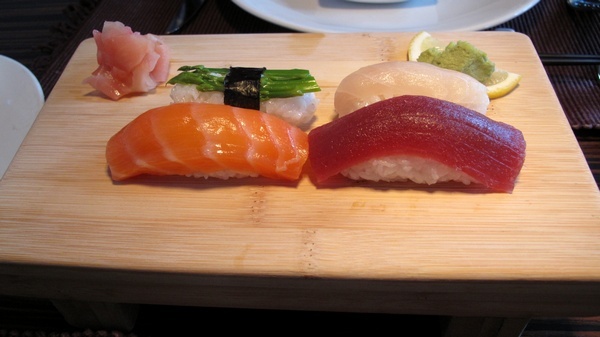 This is all over Spain, at all types of restaurants, more commonly for lunch, but occasionally for breakfast and dinner as well - a reasonably priced price fixe menu with a few choices for appetizer, a few for main, a small dessert, and often a drink, like a small glass of beer or wine - all included. 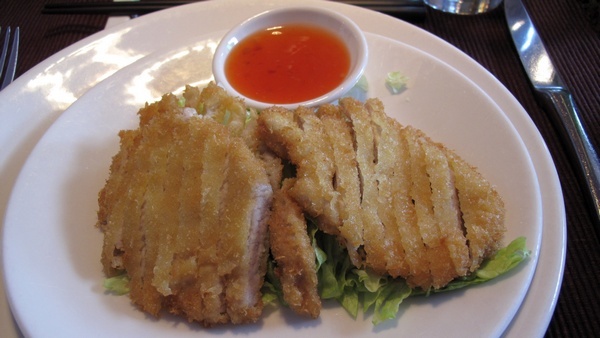 Pork cutlet with sweet-sour sauce. 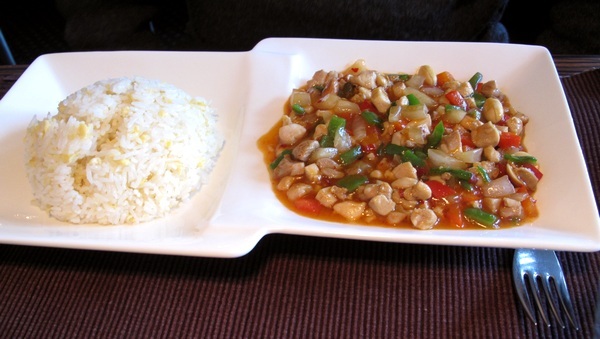 Noel's chicken stir-fry with simple fried rice. My BBQ duck stir-fry with a few veggies in there. Whaaat!? Overall, pretty decent. Like in LA what might be your second choice of your local Korean owned Chinese/Sushi delivery place. I don't mean that as a backhanded compliment - just that sometimes, you want something convenient and not so expensive and tasty, and this is in that vein. Plus, these guys are a long way from home, as are we, and it scratches the itch, so to speak. The duck was good, I imagine they either import it or make it themselves, since there probably isn't a Chinese BBQ shop around here. Could have used a lighter hand with the oil, but the sauce was pretty much in the ballpark. Rice was really well made, though, and not greasy. Either way, we had a great time catching up on the old days and what we've done in the interim. 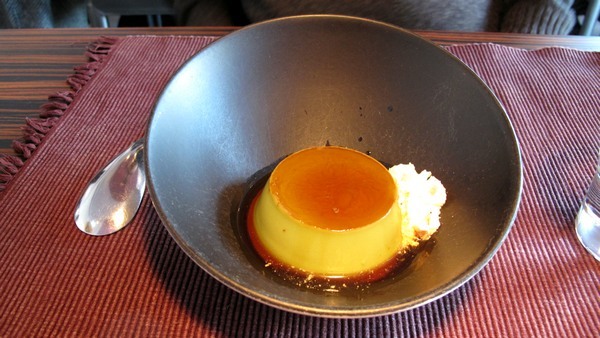 Noel's green tea flan. Mine turned out to be a glass of cava with sorbet in in. Donostia is a very special place. It has the most Michelin starred restaurants per capita in the world, apparently. It has incredible architecture, breathtaking views, and fascinating culture. Really one of the most intriguing areas I have visited. I guess I brought the sun - Noel says it's not always like this, but the whole time I was there it was gorgeous. Someone doing a little surf fishing. Fear not, plenty of food to come. I'm going to give this next one it's own entry. Restaurante Arzak.